This is how I would describe DEAD LOST, the second to the last installment of Tim O'Rourke's highly addictive series, Kiera Hudson. It's just gone wonkers and the story is like an ouroboros, a snake eating it's tail; like Back To The Future meets Groundhog Day. My mind is reeling from the events and right now I won't even try to make sense of it. All I want at this point is for Kiera & Co. to get out of the pushed world and get this ordeal over and done with! DEAD LOST is a very revealing volume in more ways than one. For starters, we finally discover who the Photographer is, or should I say PhotographerS, and why they've been so bent on messing with Kiera, Potter and the rest of the crew since they arrived in the pushed world. Leaving pictures that depict the future and notes that does nothing but stir shiznit for the already agitated bunch. In a convoluted way, the Photographers have the same goal and that is for everyone to get out of this pushed world and go back to the real one. But before they can successfully do that, there's layers upon layers of mini alternate events, personalities, etc. that overlap each other, it's like going down the rabbit hole and it's sure to give us readers a serious case of Head Fluck! 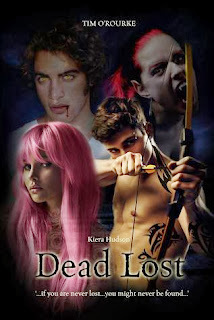 Aside from these revelations, DEAD LOST is narrated by the siblings Kayla and Isidor. Yes they're back in the fray and both have been doing pretty interesting things in the background all thiis time. I'm a little torn over this because though I'm glad they're back in the story (I sure missed them!) part of me feels they were better left dead. It would've been dramatic plus it won't be a war without collateral damage right? Not only that, their deaths left an open slot for new characters or for secondary characters to be in the forefront. But regardless of this subjective feedback, I'm still glad they're back and the roles they will play in the final book, Dead End, will be pivotal. O'Rourke did another brilliant turn in DEAD LOST. It just shows how immense Kiera's universe is and how O'Rourke planned and plotted the story to its minute details. I don't know what's going to happen in Dead End or if there will be a book 3 after this wraps up, all I wish (and I know I will get) is for the series to end with a loud BANG! And again, if you're an urban fantasy reader and haven't read this series, you're seriously missing out. In addition to that, don't be intimidated by the number of books out, the story is so good you'll devour each book in a matter of hours it won't be a challenge to catch up. True! I actually like the theme of the previous books. That is awesome you found a terrific indie series. I am all about getting behind good solid, indie authors. I will have to check this out! Hope you enjoy the rest of your weekend! Don't you just love indie and self published authors?! They're gems waiting to be found. Wow ok, so you have me curious..this sounds fast paced and intense! It is a great indie series, I hope you get to it soon! Yup but not confusingly so. The world is complex but there's a method to the madness that I've come to appreciate. It's genius really. Glad to see you enjoyed it. I have some catching up to do . An ouroboros ...!! LOL that is a crazy cover. Glad you enjoyed it Braine. I really really need to try this author, I keep hearing amazing things about the books!